Veeam Management Pack for System Center v8 Update 3 is NOW Available! It has been an extremely busy time for Veeam with the release of Veeam Availability Suite 9.5, the release of Veeam Backup for Microsoft Office 365 as well as the upcoming public beta of Veeam Agent for Microsoft Windows. This release trend is continuing and today I am pleased to announce the general availability (GA) of Veeam Management Pack (MP) for System Center Update 3 and its Availability for download! 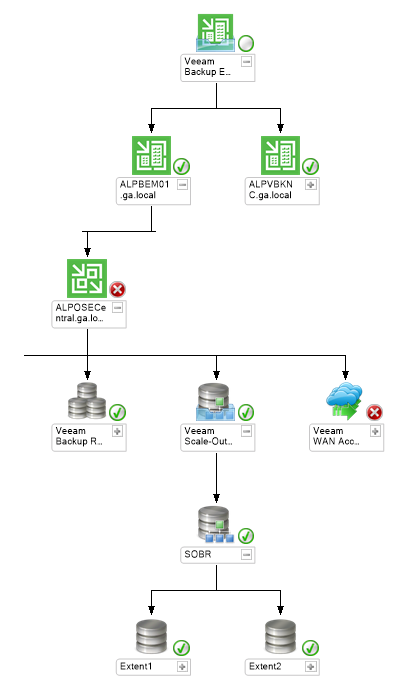 What is the Veeam Management Pack? The Veeam Management Pack for System Center provides integration, monitoring, advanced reporting and detailed topology features for virtualized environments, including the virtual machines, the physical hosts and the associated network and storage fabric. The Veeam MP allows these advanced features to be leveraged across multiple System Center components, including System Center Operations Manager (SCOM), Orchestrator (SCORCH), Virtual Machine Manager (SCVMM) and Service Manager (SCSM). The Veeam MP Update 3 provides many great enhancements as well as some brand new features that will allow customers to maintain operational Availability of their VMware and Hyper-V environments. Let's take a closer look at what's new with the Veeam MP! What's NEW in Update 3? Providing support of the latest operating systems from VMware, Microsoft as well as the rest of our eco-system partners as soon as possible is something that Veeam prides itself on. The Veeam MP for System Center provides full support for Microsoft's latest iterations of Windows Server 2016, Hyper-V Server 2016 and System Center 2016. Also included is full support of vSphere 6.5 – during our testing of vSphere 6.5 our QC team found no incompatibilities when monitoring within SCOM! On top of the Windows Server 2016 support, significant scalability improvements within Hyper-V environments have been added. Cluster Shared Volumes (CSV) is a common way for storing virtual machine hard disks within Hyper-V Cluster deployments. Veeam has increased the supported number of VMs per host as well as the number of CSVs per cluster that can be monitored. In March 2014, VMware released their fully integrated storage solution, vSAN. This product has been wildly successful and has achieved fantastic market adoption. In fact, a recent blog post by VMware's Duncan Epping states that vSAN (recently renamed from VSAN) now has over 5,500 customers worldwide! The Veeam MP for System Center includes a new capability to track alarms from vCenter on vSAN health and configuration. This includes over 70 new monitors that allow you to keep a very close eye on your vSAN software-defined storage and the network and storage hardware that backs it. Within Operations Manager you can view the health of your vSAN infrastructure inside of the monitoring pane under the Veeam for VMware MP and then within the vSphere Storage section. The monitors specific to vSAN are included as rollup monitors within the vSphere Cluster object group. 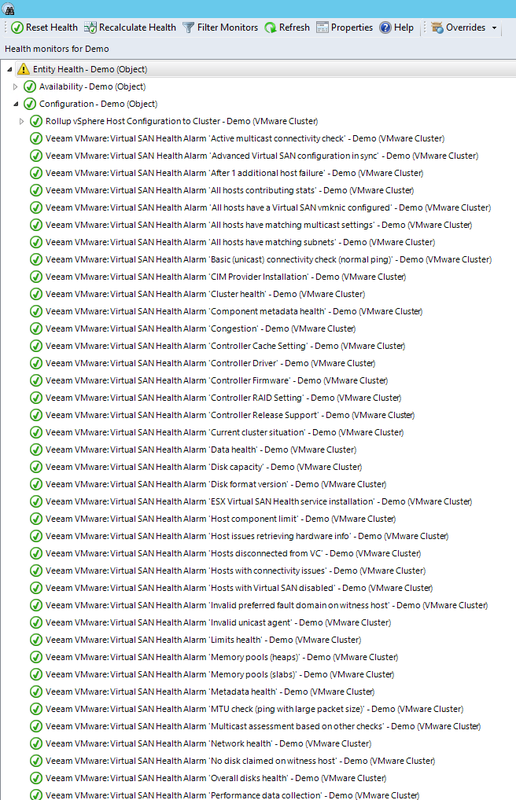 Additionally, the Veeam MP continues its awesome knowledge base by including updated product knowledge for each and every vSAN monitor. 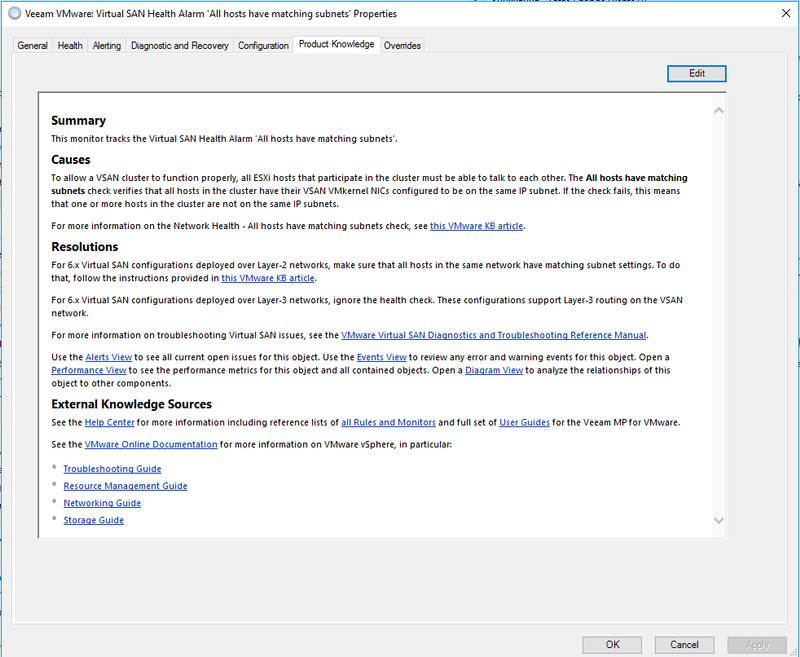 This built-in knowledge provides known causes, possible resolutions and links to external knowledge resources including VMware KB articles. Several other key updates have been made to the Veeam MP for System Center, specifically around the management of customized VMware vCenter alarms via the Veeam MP vCenter Alarm Monitor. For instance, if you have a specific hardware vendor integration that has created specialized vCenter alarms, Veeam MP now includes a simple wizard-driven configuration to create an MP monitor to track the state of that custom alarm. Also now it is easy to review the status of the ESXi Host Services. Within the host view of the Veeam MP there is a task that can query and report back on which service daemons are started or stopped. With this it’s now possible to monitor the state of an ESXi service and fire an alert when a state changes. For example, let’s take the ntpd service. Maintaining time consistency across the environment is crucial to ensuring that everything communicates correctly. In this example, an administrator could create a monitor for the ESXi service via the Create Unit monitor wizard and be alerted to avoid issues before they even occur. 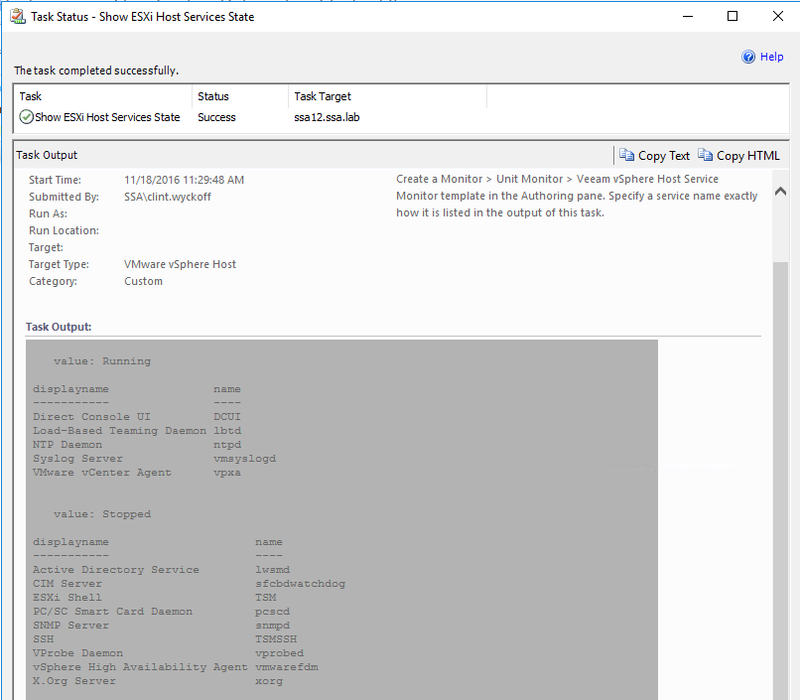 Show ESXi Host Services State task which can be run to get the list of all services that are running or stopped on a given ESXi host. One of my favorite Veeam MP features is the very popular Veeam Morning Coffee Dashboard! The Morning Coffee Dashboard gives you a real-time, at-a-glance overview of your VMware and/or Hyper-V infrastructures. 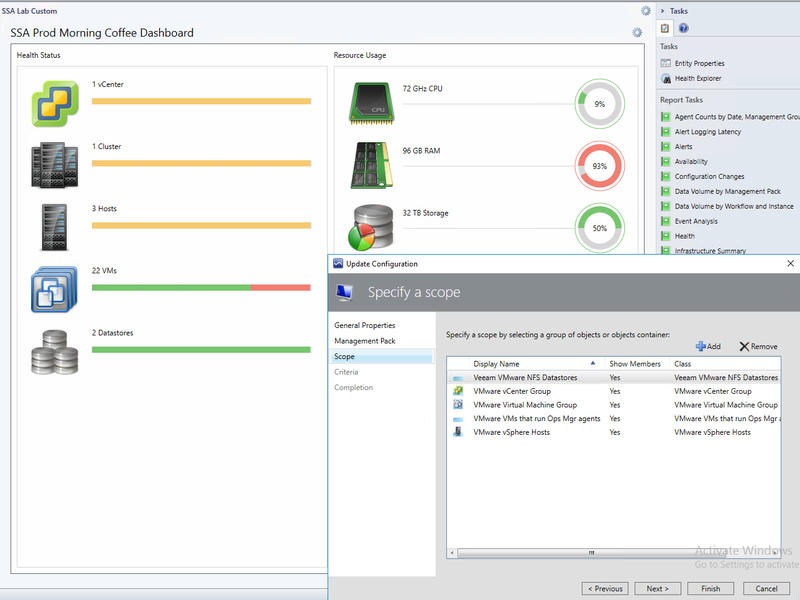 The out-of-the-box Morning Coffee Dashboard looks across all vCenters or Hyper-V environments that you are monitoring within SCOM and provides a holistic overview. New within the Veeam MP, you can now customize and create your own Morning Coffee dashboards. This will be especially handy in distributed environments where there are individual virtualization deployments, perhaps at multiple locations across the organization. These customized dashboards will give you the ability to create overview views that are specific to each environment and each individual admin can keep an eye on a particular view or set of views. The Veeam Management Pack for System Center provides you with all of the information and details of your virtualized environment through the familiar and powerful framework that System Center provides. If all of this sounds cool, you should definitely head over to Veeam.com and download your copy of the Veeam Management Pack for System Center Today!